+$20 per photo | Our 3 Day Rush turn around time is 3 business days from the time we receive the product and the order is placed. +$60 per photo | Our 24 Hour Rush turn around time is 24 hours from the time we receive the product and the order is placed. Products must arrive before 11am for next day delivery. Please call before submitting order. All our turn around times are guaranteed to be delivered within the turn-around specified. Our turn around times don't vary based on how busy we get. Just make sure to calculate the correct turn around time, which is discussed below. It is a common misunderstanding about how Business Days work which leads to confusion about when the order will be delivered. Turn around starts when the products arrive and are checked in. You will receive a confirmation email when this happens. One day = 24 hours. We are closed Sat, Sun & holidays. If you anticipate your products to arrive on Monday say to yourself "Monday to Tuesday, 1 day. Tuesday to Wednesday, 2 days..." when you get to the end of the week say "Friday to Monday, 5 days". We've created some visuals below to help demonstrate this. 7 business day turnarounds always have a weekend interruption. This usually makes the turn around time total 10 days. If you order 3 business day rush and the products arrive by Tuesday, then they will be turned around by Friday. This is our fastest normal turn around time. You'll notice there are 4 phases to any project. Day 2: Products are photographed. Day 3: Photos are retouched. Day 4: Photos are reviewed and uploaded first thing in the morning. In this example, Tuesday does not count as 1 day because 1 day is = 24 hours, but it does count as a portion of the 24 hour day. So if a package arrives at 9am Tuesday, that is only 8 hours until the end of the day. We need a full 72 hours to complete the process. You'll notice the delivery day is First thing Friday morning, which is between 9am - 10am CST. So packages that arrive on Tuesday at 9am are fulfilled within 72 hours, but packages delivered at 4pm are fulfilled slightly earlier than 72 hours. If products are delivered on Wednesday there will be a weekend interruption as the order must follow these 4 phases. Super Rush is special because everything must be completed immediately. Super Rush is available on a case by case basis. For example, Super Rush orders that arrive at 2pm on Tuesday will be delivered on Wednesday at 2pm. We close for traditional American holidays, so it's important to plan ahead on how this will affect your turn around times. Notice in the example how the Thanksgiving holiday will delay an order 2 additional days. Turnaround time will stop while an order is On Hold. An order that is placed "On Hold" is an order that is stopped for various reasons and is awaiting a Customer action. POW will send the Customer an email notifying them that an order is On Hold. No shooting direction has been provided. Not enough shot direction has been provided to proceed with shooting. POW is awaiting a Customer reply regarding pre-approval images. Any other reason which may hinder POW’s ability to shoot the product. Turn around times begin when the products arrive. There must be an active order when they arrive to start this timer. Please Note: Do Not Send Your Products Before Placing An Order. It will not expedite your order and may result in delays. It is difficult for us to keep track of products that do not have an order number associated because of the volume of orders coming and going. Standard Turn Around orders are shot in the order they are received, like a Queue system. So if there are few orders in the queue your order may be shot faster. Rush orders skip to the front of the shooting queue. Super Rush, 24 hour orders require pre-approval by phone or email. We need to make sure that we can actually turn it around in time. For example, if a customer wants 24 turn around time and it's Friday, we will not be able to accomplish the order in time because we are closed on the weekends. Will My Photos Get Shot Quicker If I Do Early Morning Delivery? Typically no. Your products will not get completed sooner if they are delivered with early delivery unless you order 24 hour super rush. The best is to send it UPS ground as they have the cheapest guaranteed delivery time, arriving here around 2pm. How Will I Know When My Photos Are Complete? We'll send you an automated email with a link to your gallery. This will end the turn around time. 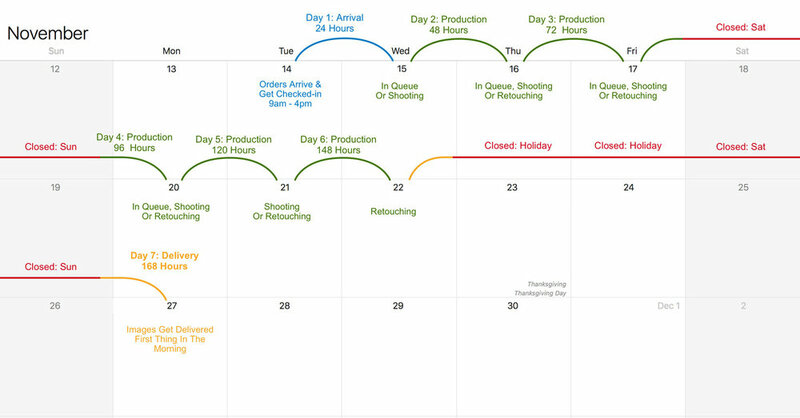 Our turn around time on reshoots is 5 business days from the time the redo order is received. If I Order Standard Can I Upgrade to Rush or Super Rush? Yes, but you'll need to let us know. We'll send you a special invoice for the project and once paid we'll upgrade your order. How Will I Know When My Turn Around Time Begins? Once your product arrives, we'll check it into our system and send you an automated email. Can You Come In On The Weekends Or Holidays To Shoot My Products? We're a very small team and we work hard during the week to provide a great service. As with most B2B businesses we take weekends and traditional holidays off to spend with our families.